Surveyors played a central role in Thomas J. Nevin’s family life and early career as a commercial photographer and government contractor. 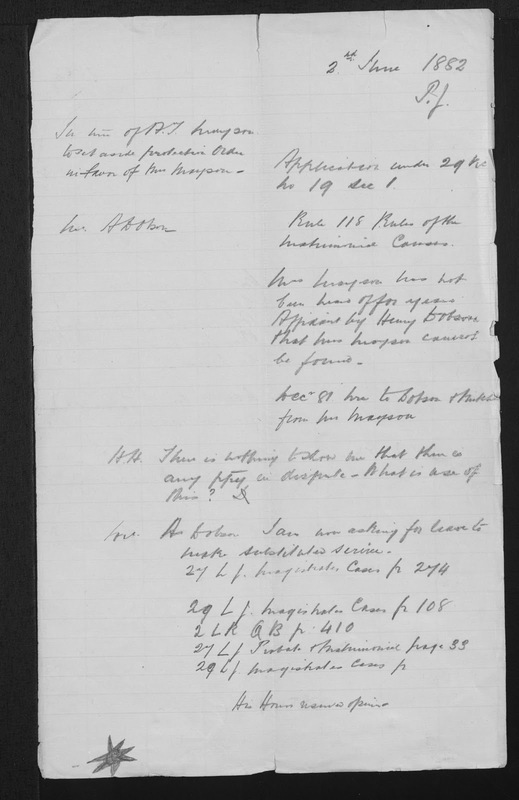 On 22nd May, 1868 at the Town Hall, Hobart, he signed the the birth registration of William Nevin Tatlow Hurst, as informant for the child’s father, surveyor John Hurst while absent from Hobart on business. 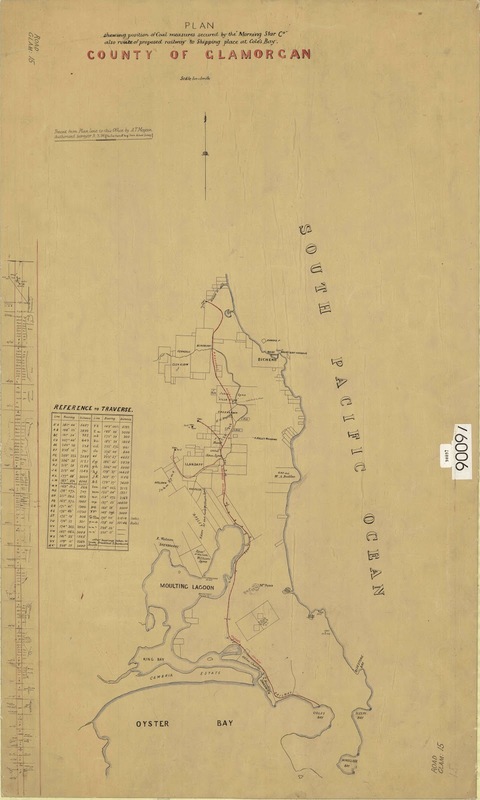 John Hurst’s father, James Hurst was also a surveyor who held the lease for the Salt Water Coal Mines, on the Tasman Peninsula. The Nevin and Hurst families were not only neighbours in New Town Hobart; they both had historic family connections to Grey Abbey, County Down, Ireland, where Thomas Nevin’s father, John Nevin snr was born in 1808. 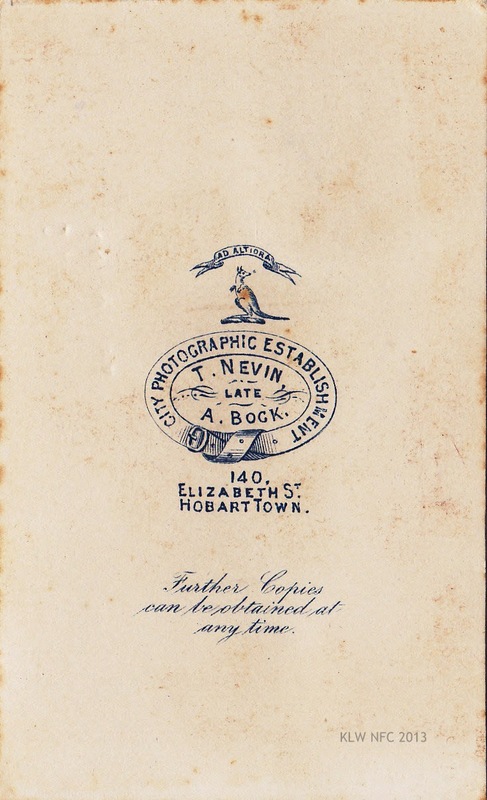 Earlier the same year, in February 1868, with the dissolution of his partnership with Robert Smith while operating as the firm “Nevin & Smith“ at Alfred Bock’s former studio, the City Photographic Establishment, 140 Elizabeth St. Hobart, Thomas Nevin was issued with rolling government commissions and contracts by his family solicitor, Attorney-General W. R. Giblin for the Lands and Survey Department. He accompanied surveyors on excursions, providing Surveyor-General J. Erskine Calder with photographs mounted as stereoscopic prints of landslips, water erosion, rock and cave formations, river flooding, mining operations, etc between 1868 and 1873. 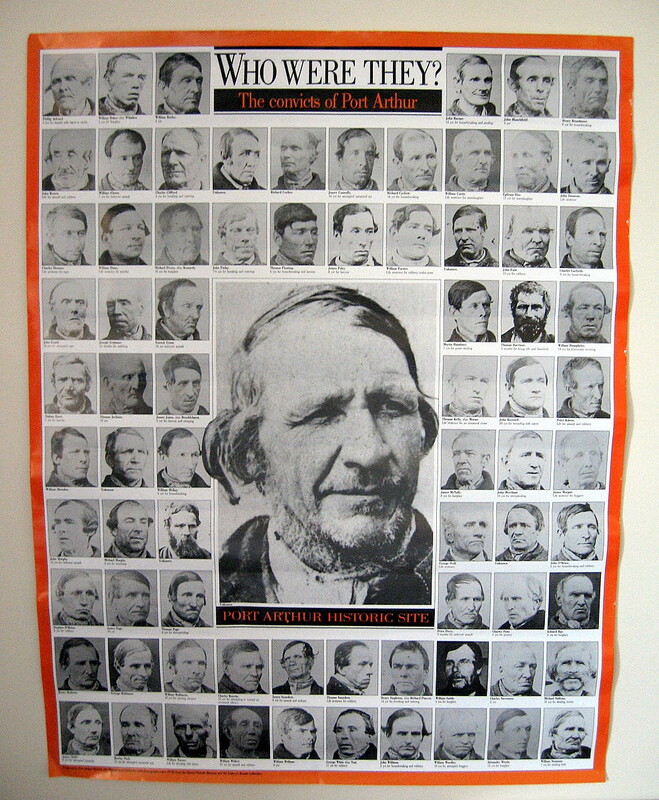 From 1873 to the 1880s, his rolling contracts were extended by Attorney-General W. R. Giblin to photographing prisoners at the Hobart Gaol and Port Arthur prison; at the Supreme Court next to the Hobart Gaol; and at the Mayor’s Court for the Municipal Police Office, in the Hobart Town Hall. 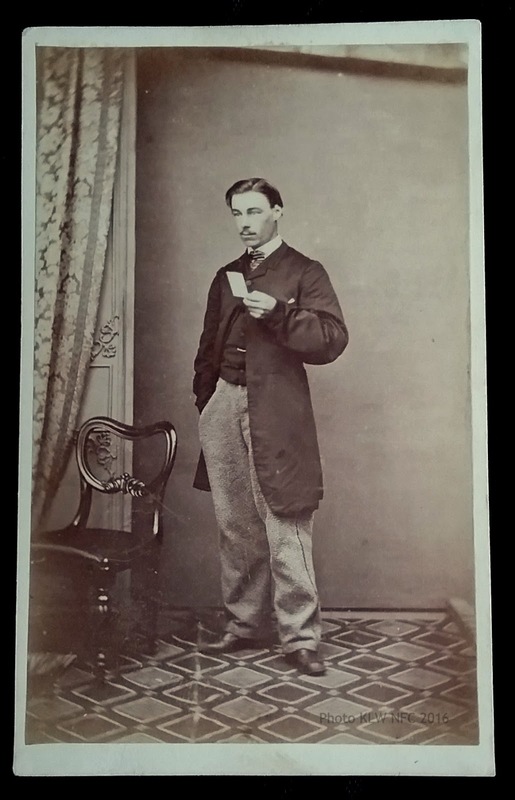 One of those surveyors, Alfred Threlkeld Mayson, visited the studio at 140 Elizabeth St. Hobart for a portrait in 1865. What follows is a short account of the breakdown of his marriage to Elizabeth Amos. Thomas J. Nevin, June 1872. Verso stamped with Nevin’s Royal Arms insignia issued by Lands Dept. Verso bears Nevin’s Royal Arms insignia stamp issued by Lands Dept. 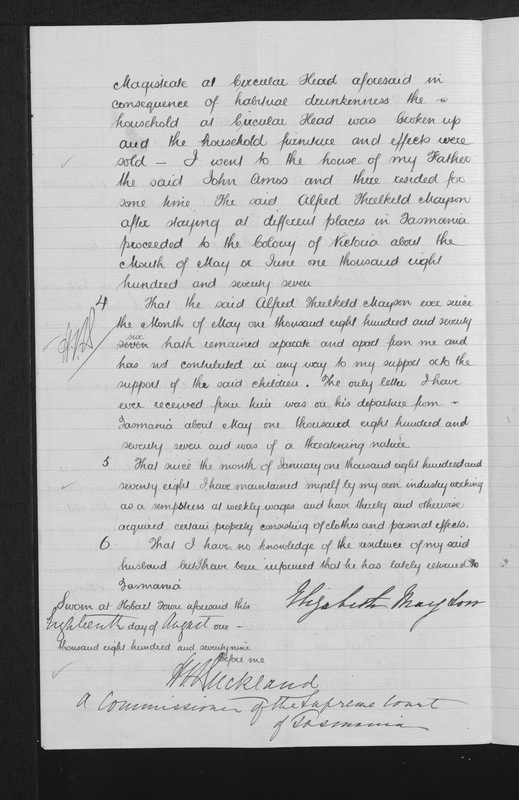 At Great Swan Port, on the east coast of Van Diemen’s Land (Tasmania), on 14th April 1845, Elizabeth Amos was born to farmer John Amos and his wife Elizabeth Amos nee Hepburn. Her future husband, Alfred T. Mayson, was born in the same district on 13th September 1839 to Joseph Mayson, Cleric in Holy Orders, and Elizabeth Mayson nee Hickson. 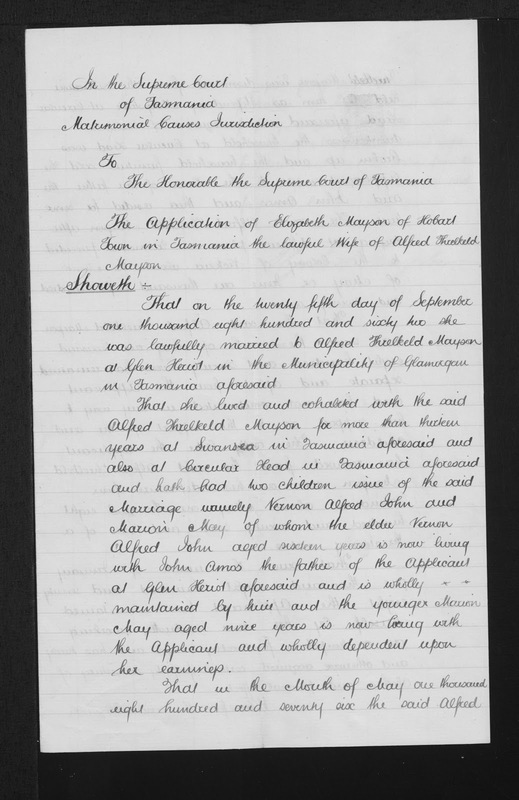 Alfred Mayson acquired the unusual middle name “Threlkeld” perhaps as an afterthought by his father, naming him in honour of missionary Lancelot Edward Threlkeld [see bio at ADB]. 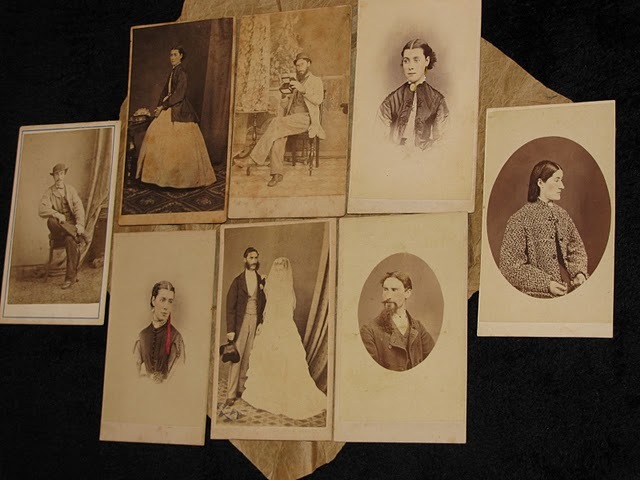 When Elizabeth Amos and Alfred Threlkeld Mayson married on the 25th September 1862 in the dwelling house of her father, John Amos, at Glenherriot, Glamorgan (Swansea, Tasmania), she was just 17 years old. 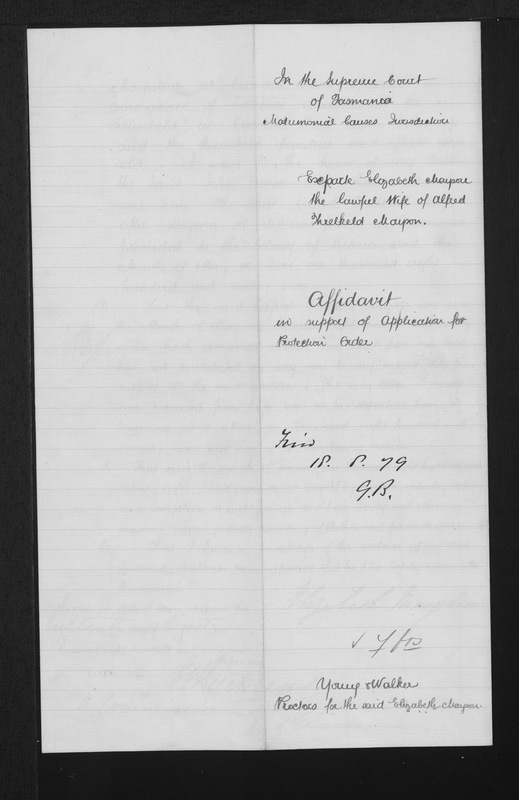 Alfred Threlkeld Mayson, 23 yrs old, registered his occupation as Council Clerk. They were married in the rites of the United Church of England and Ireland, by Joseph Mayson, Chaplain, Alfred Mayson’s father. 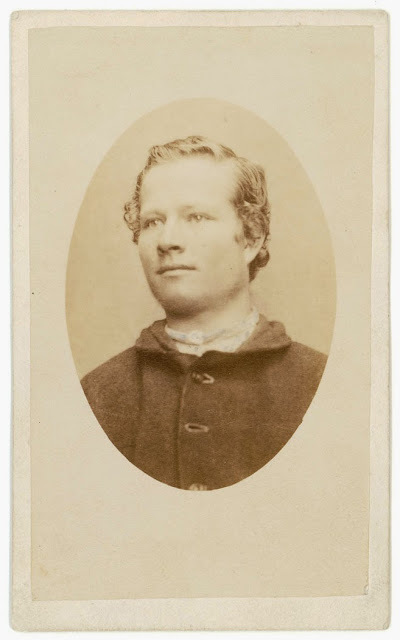 By 1865, when Alfred Bock took this photograph of Alfred Threlkeld Mayson at the City Photographic Establishment, 140 Elizabeth St. Hobart Town, Thomas Nevin was most likely present as well in the studio, having joined Bock as a junior partner in 1863 while still operating his own studio at New Town. 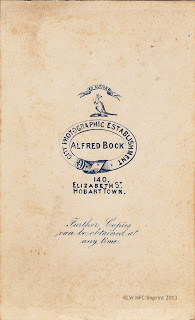 He acquired Alfred Bock’s photographic stock, government contracts for the Lands Dept., and Hobart City Council, the glass house, the studio lease and the business name shortly before Bock’s permanent departure to Victoria in 1867, whereupon Robert Smith joined Thomas Nevin briefly in the partnership Nevin & Smith at 140 Elizabeth St.
Elizabeth Mayson may well have been photographed by Alfred Bock in the same session. 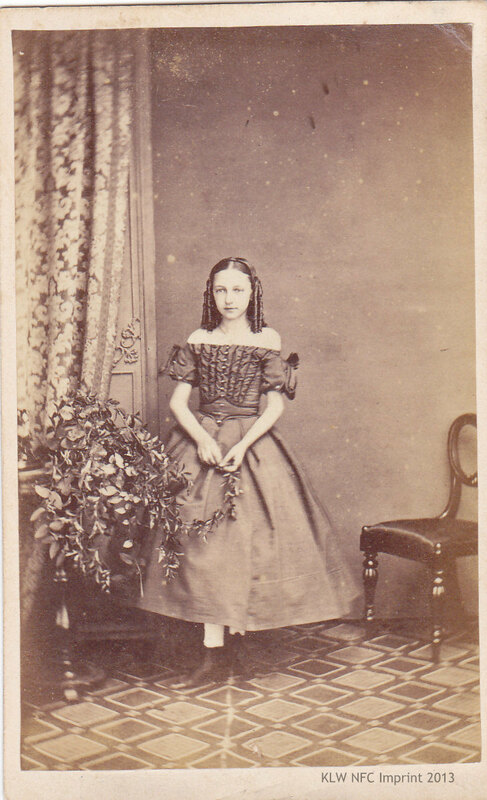 This full-length carte-de-visite of a girl in her teens was taken at Bock’s studio no later than 1866, and possibly about the same time. 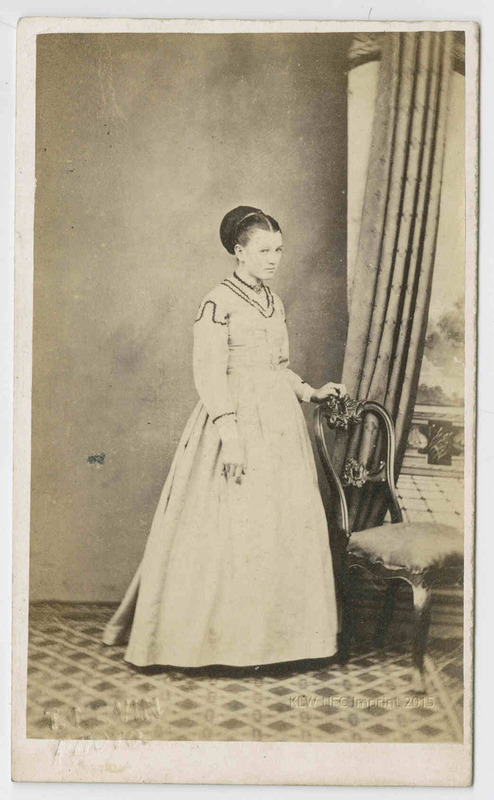 In December 1865 when Alfred T. Mayson visited Bock’s studio, Elizabeth Mayson nee Amos (b. April 1845) would have been 20 years old. 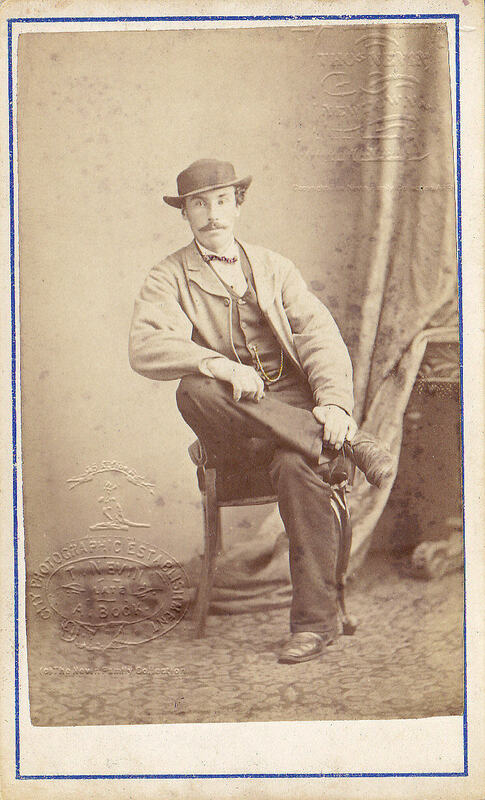 Alfred T. Mayson posed for his full-length portrait holding a carte-de-visite, no less, though gazing up rather than at it. The studio decor in both photographs also appears in the photograph taken of Thomas J. Nevin ca.1866, wearing white gloves and holding a stereoscopic viewer. Elizabeth Mayson gave birth to two children while married to Alfred T. Mayson: Vernon in 1863 and Marion in 1869. 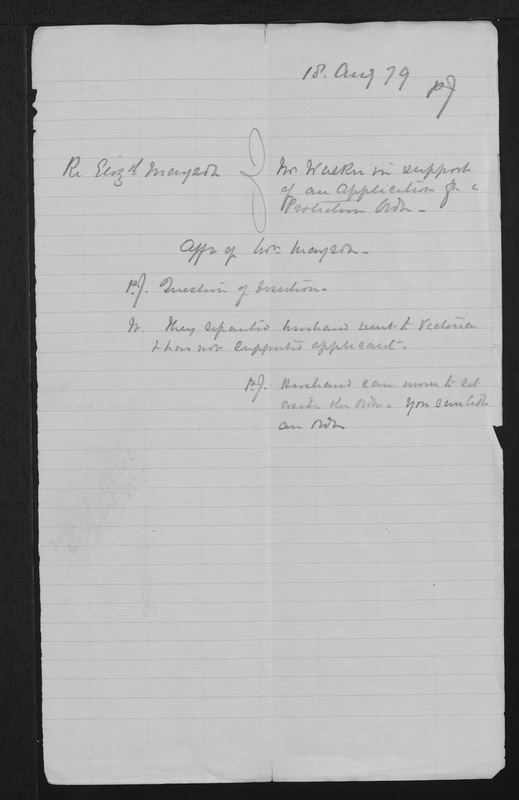 Alfred Threlkeld Mayson’s occupation in 1863 was listed simply as Council Clerk when he registered his son Vernon’s birth registration. 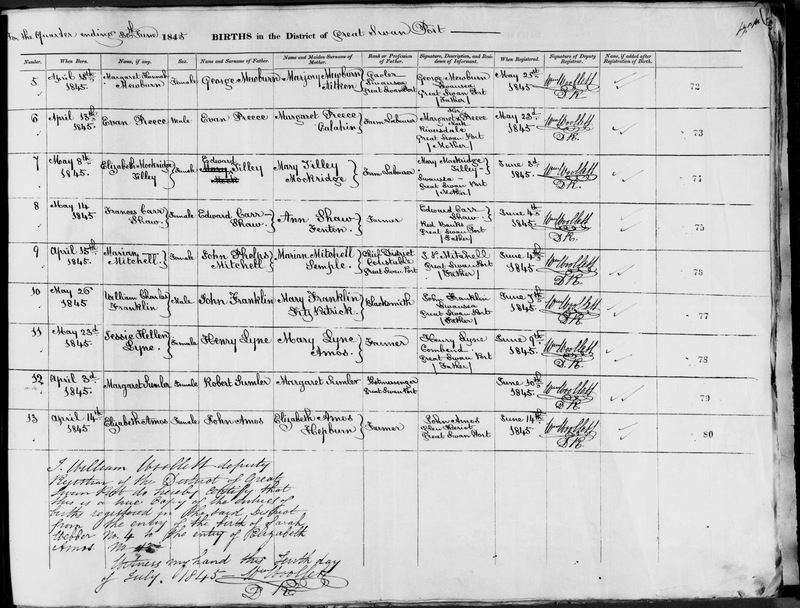 On the 1869 birth record for his daughter Marion, his mother-in-law Elizabeth Amos, mother of Elizabeth Mayson and grandmother to Marion, was the registration informant. 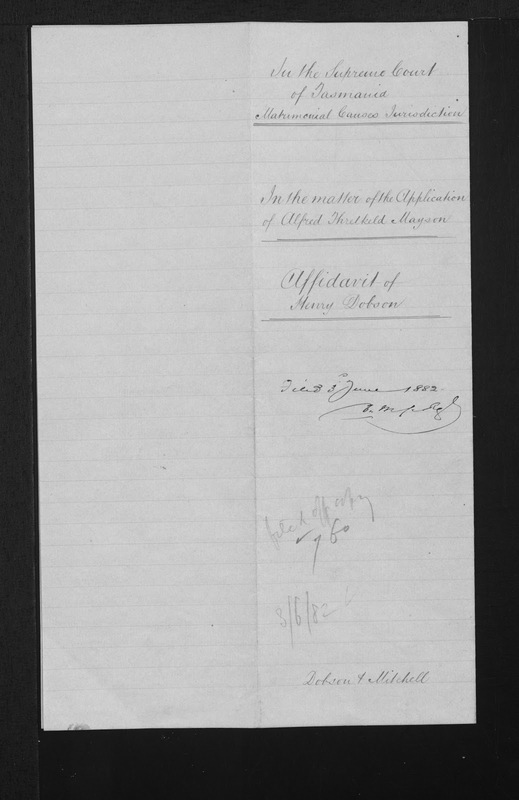 Alfred T. Mayson’s occupation was listed as Assistant District Magistrate. 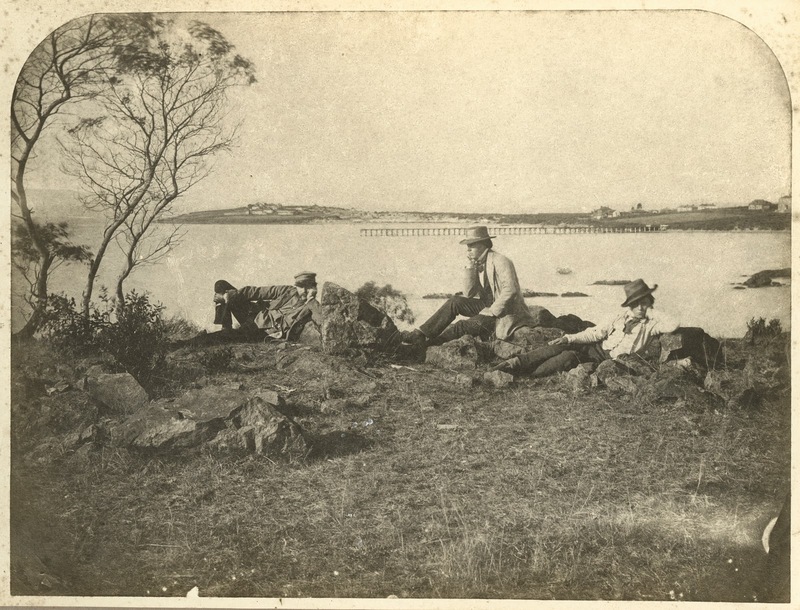 When this photograph (below) was taken of Alfred Mayson (recumbent, on viewer’s left) in the company of surveyors Davidson and Watson in the late 1860s, Mayson was leaving his mark on the landscape as a surveyor around the Glamorgan and Swansea districts of the east coast of Tasmania; for example, these two mountains were named after his own family – Mt. Mayson, and that of his wife’s family – Mt. Amos. 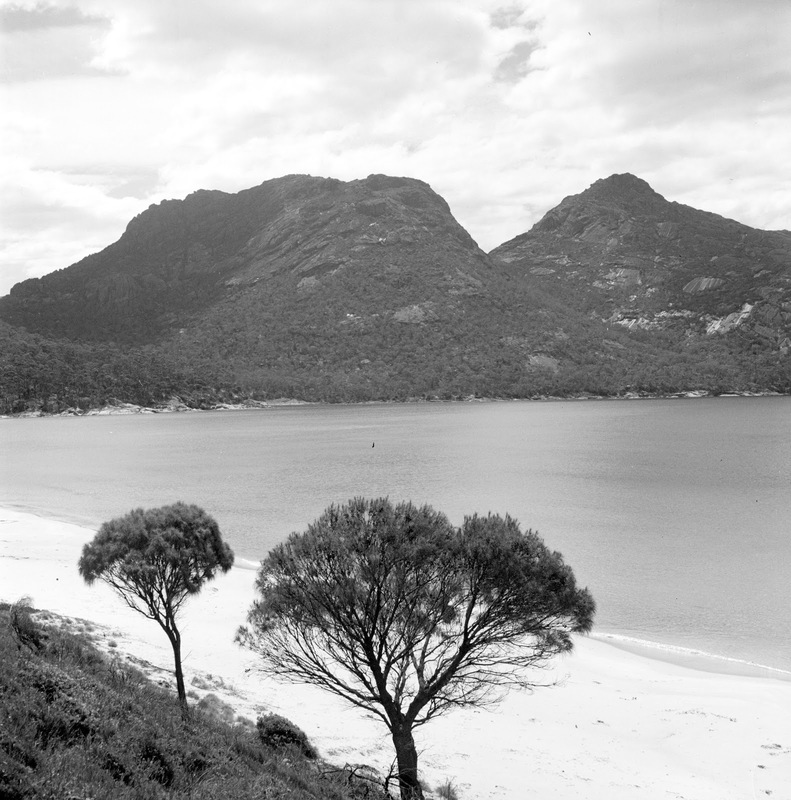 Title:Photograph – Mts Mayson and Amos from Wineglass Bay. Notes: Series Notes: Photographs taken by Jack Thwaites, largely in Tasmania. 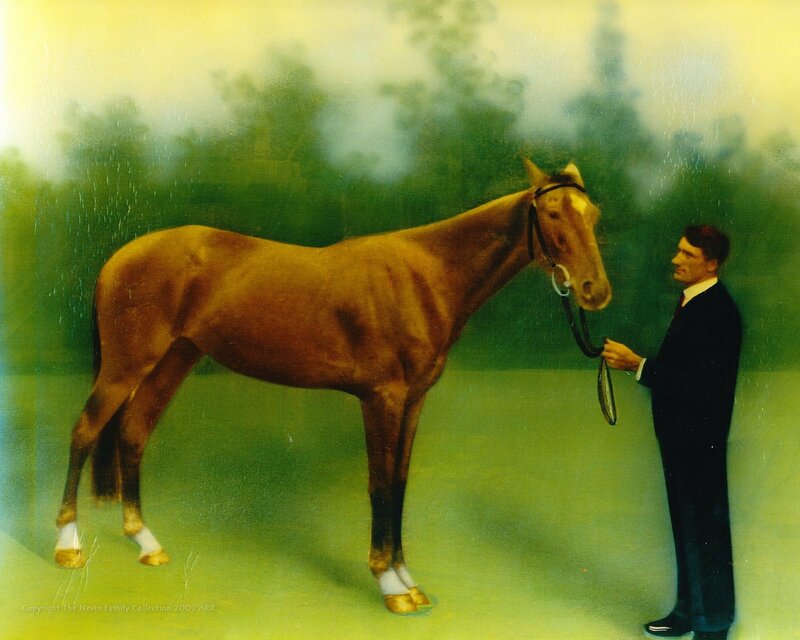 Not much is known about surveyor Watson [T. Watson, landholder, Glamorgan?] at right of the photograph below, but James William Davidson (in centre) was possibly the husband of portraitist Letitia Davidson whose brother Henry Frith might have been the photographer, the fourth person present here. Detail: Alfred T. Mayson on viewer’s left in group photograph below with surveyors Davidson and Watson. Unattributed but possibly taken by Henry Frith late 1860s. Title: Photograph – A group of surveyors ( Davidson, Mayson, Watson ) at Waterloo Point, Swansea. COURT of REQUESTS. – At Stanley, on the third Wednesday in every month. 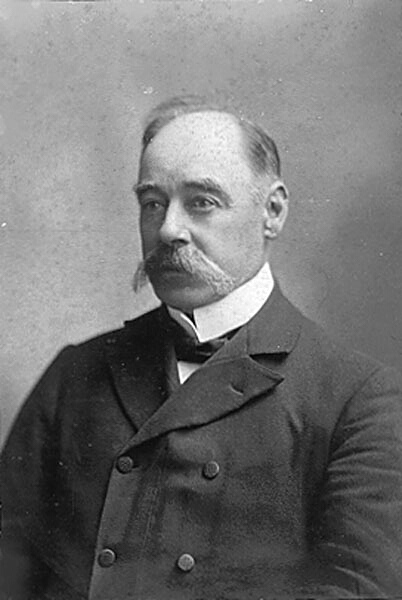 Commissioner A. T. Mayson. 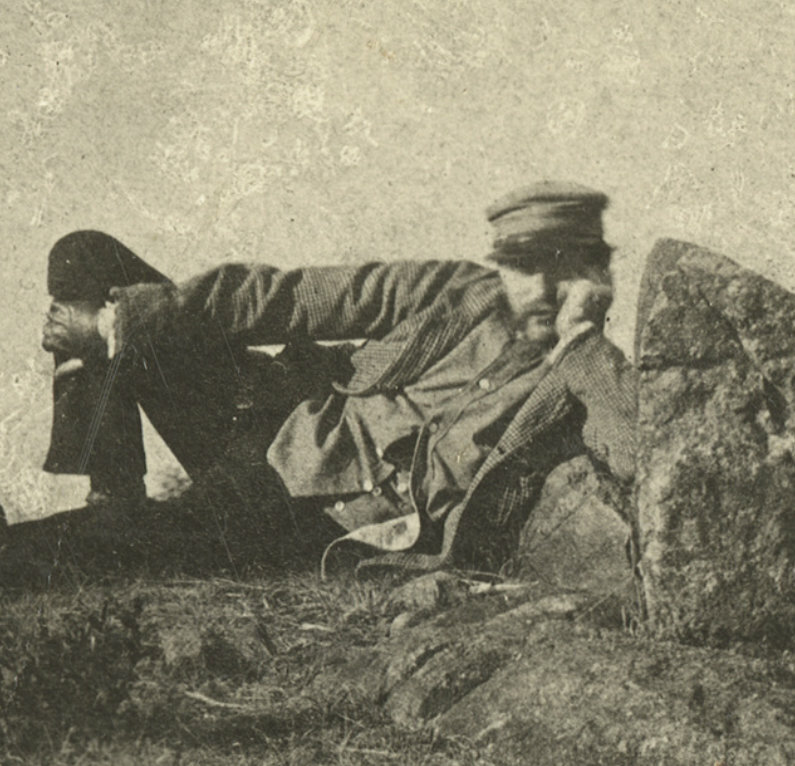 Title: Photograph – Alfred Mayson, surveyor. [n.s., n.d.] 1890s? 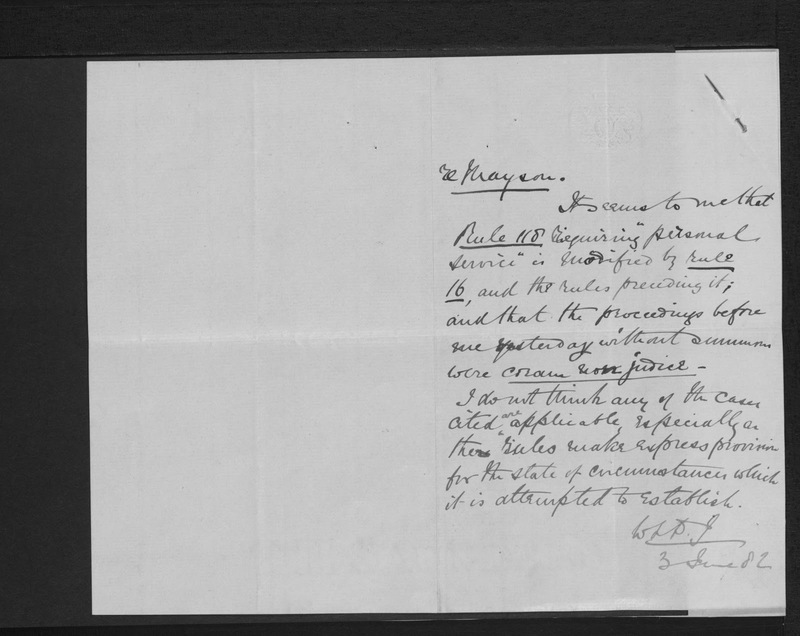 But by 1877 Elizabeth Mayson was petitioning for separation. She filed an application for protection of her earnings and property in 1879, citing Alfred Mayson’s alcoholism, gambling and loss of his job as Stipendiary Magistrate as reasons. She separated permanently from Alfred T. Mayson in 1877 taking both children with her to the residence of her father, John Amos. Alfred T. Mayson used Dobson & Mitchell lawyers in response to the petition. 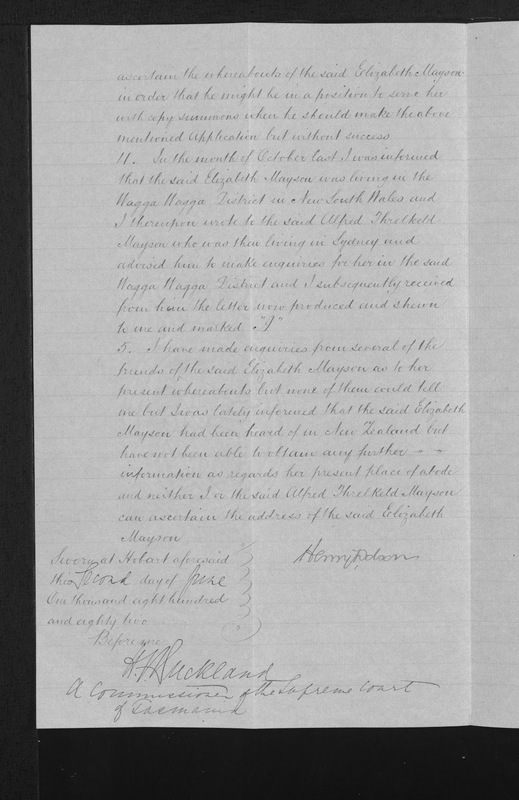 They claimed Elizabeth Mayson could not be found by June 1882, so Mayson’s claim to set aside his wife’s application was discharged. Elizabeth Mayson married Charles Borradale (1845- 1917) sometime after gaining a divorce from Alfred T, Mayson (date ? ), and resided in Victoria. She died at the Borradale family home, 33 Morah St Parkville, Melbourne in 1907, aged 62 years. Widower Charles Borradale then remarried to Margaret McGregor who survived him and continued to live at the house in Morah St. Parkville. Charles Borradale died on 22nd April 1917, aged 71 years. He was wealthy enough to erect a large tombstone for his wife Elizabeth Mayson Borradale nee Amos and himself in the Melbourne General Cemetery, Victoria. His estate was considerable, although his last occupation was simply “cabdriver”. 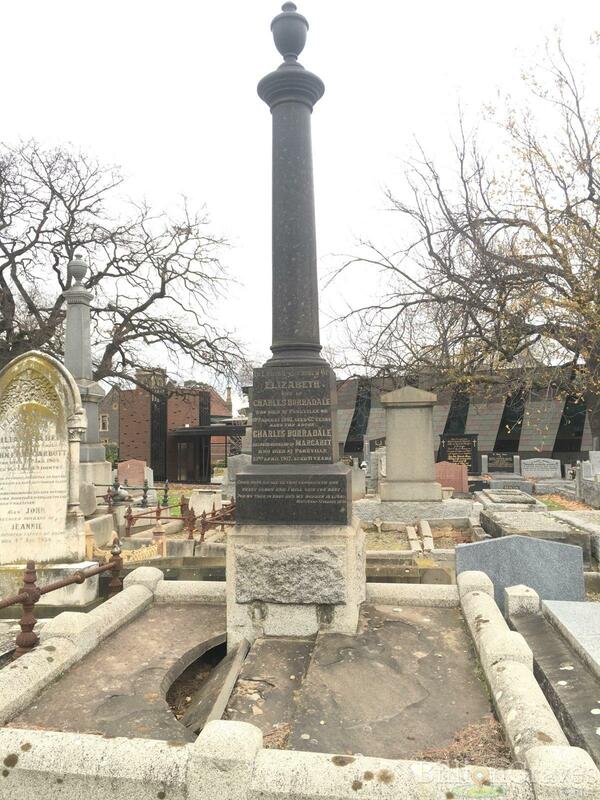 Elizabeth Mayson Borradale nee Amos was buried with her second husband Charles Borradale in this grave (photograph below), at what is now known as the Melbourne General Cemetery. 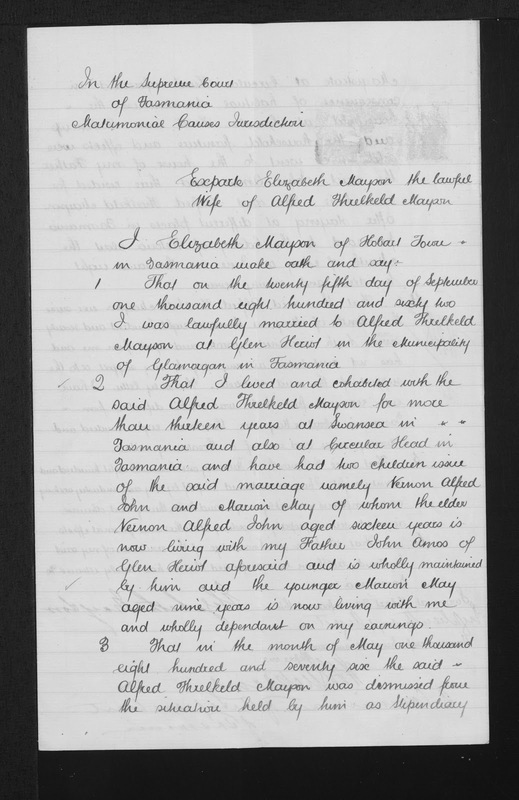 Her son Vernon married a relative of his mother’s family, Margaret Winifred Amos, at Glamorgan, Tasmania, on 1st October 1888 (NAME_INDEXES :902698, Archives Office Tasmania). Charles Borradale, late of 33 Morrah Street, Parkville, retired cabdriver, left estate valued at £3143.0/1 of realty £492, and personalty £2651/0/1, to his relatives. 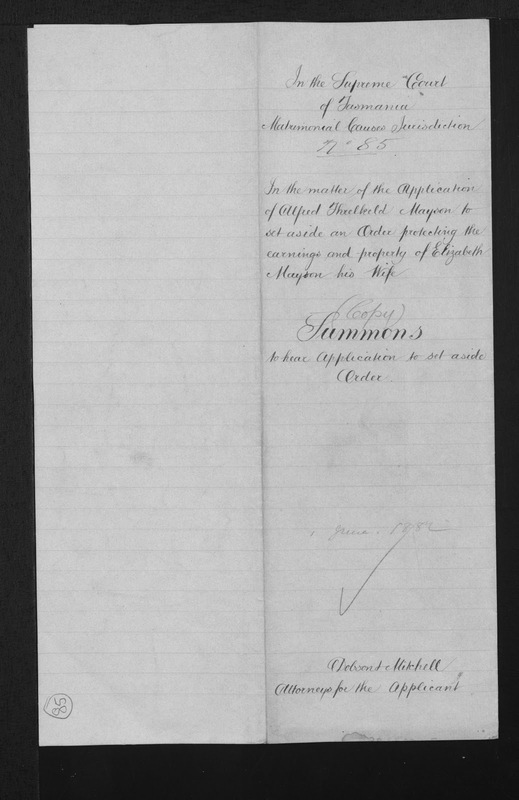 Elizabeth Mayson applied for a protection order three years after her initial separation from Alfred T. Mayson in 1876. 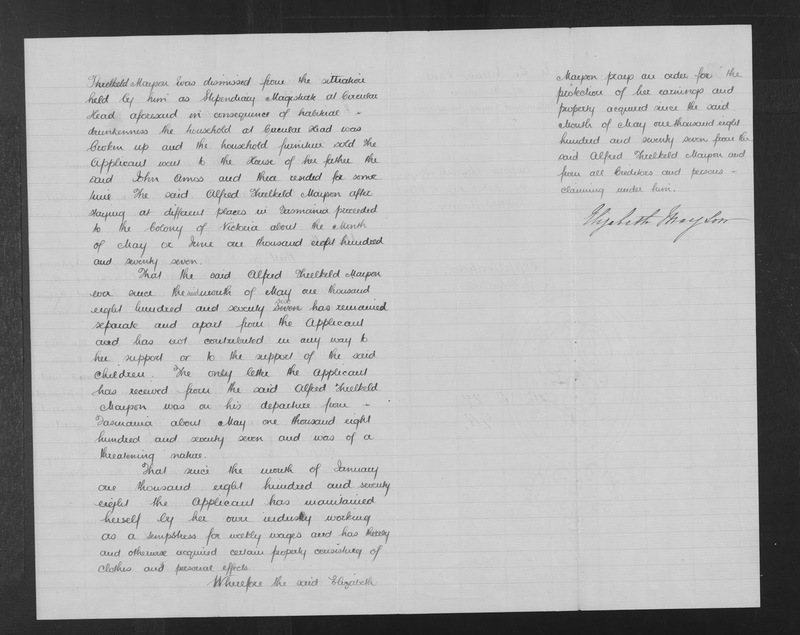 Below is a rough and ready attempt at transcripts of the documents exchanged between the legal representatives of Elizabeth Mayson nee Amos and her husband Alfred Threlkeld Mayson. That she lived and cohabited with the said Alfred Thelkeld Mayson for more than thirteen years at Swansea in Tasmania aforesaid and also at Circular Head in Tasmania aforesaid and hath had two children issue of the said marriage namely Vernon Alfred John and Marion May of whom the elder Vernon Alfred John aged sixteen years is now living with John Amos the father of the applicant at Glen Heriot aforesaid and is wholly maintained upon her earnings. Threlkeld Mayson was dismissed from the situation held by him as Stipendiary Magistrate at Circular Head aforesaid. In consequence of habitual drunkenness the household at Circular Head was broken up and the household furniture sold. The applicant went to the House of her father the said John Amos and there resided for some time. The said Alfred Threlkeld Mayson after staying at different places in Tasmania proceeded to the Colony of Victoria about the Month of May or June one thousand eight hundred and seventy seven. That the said Alfred Threlkeld Mayson ever since the said month of May one thousand eight hundred and seventy [seven struck through] six has remained separate and apart from the applicant and has not contributed in any way to her support or to the support of the said children. 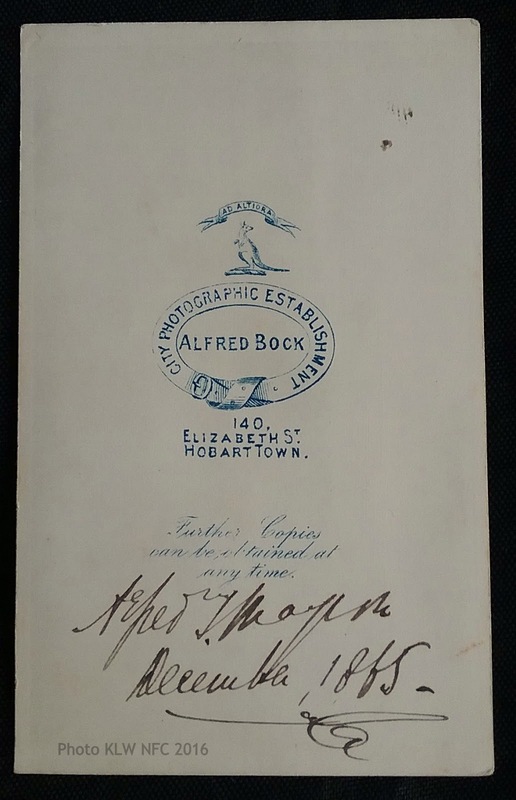 The only letter the applicant has received from the said Alfred Threlkeld Mayson was on his departure from Tasmania about May one thousand eight hundred and seventy seven and was of a threatening nature. That since the month of January one thousand eight hundred and seventy eight the applicant has maintained herself by her own industry working as a sepmstress for weekly wages and has thereby and otherwise acquired certain property consisting of clothes and personal effect. Wherefore the said Elizabeth Mayson prays an order for the protection of her earnings and property acquired since the said Month of May one thousand eight hundred and seventy seven from the said Alfred Threlkeld Mayson and from all Creditors and persons claiming under him. They separated husband went to Victoria & has not supported applicant . Exparte Elizabeth Mayson the lawful wifeof Alfred Threkeld Mayson. 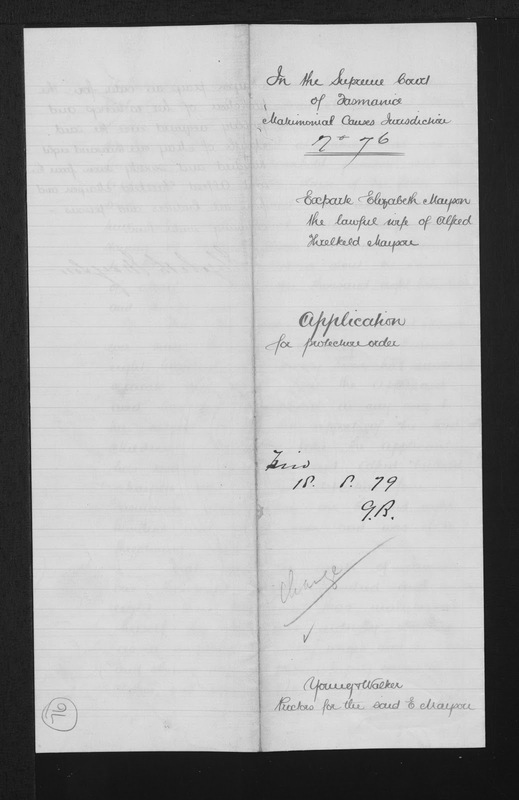 Affadavit in support of application for Protection Order. 1 That on the twenty fifth day of September one thousand eight hundred and sixty two I was lawfully married to Alfred Threlkeld Mayson at Glen Heriot in the Municipality of Glamorgan in Tasmania. 2 That I lived and cohabited with the said Alfred Threlkeld Mayson for more than thirteen years at Swansea in Tasmania and also at Circular Head in Tasmania and have had two children issue of the said marriage namely Vernon Alfred John and Marion May of who the elder Vernon Alfred John aged sixteen years is now living with my father John Amos of Glen Heriot aforesaid and is wholly maintained by him and the younger Marion May aged nine years is now living with me and wholly dependent on my earnings. Magistrate at Circular Head aforesaid in consequence of habitual drunkenness the household at Circular Head was broken up and the household furniture and effects were sold – I went to the house of my Father the said John Amos and there resided for some time. 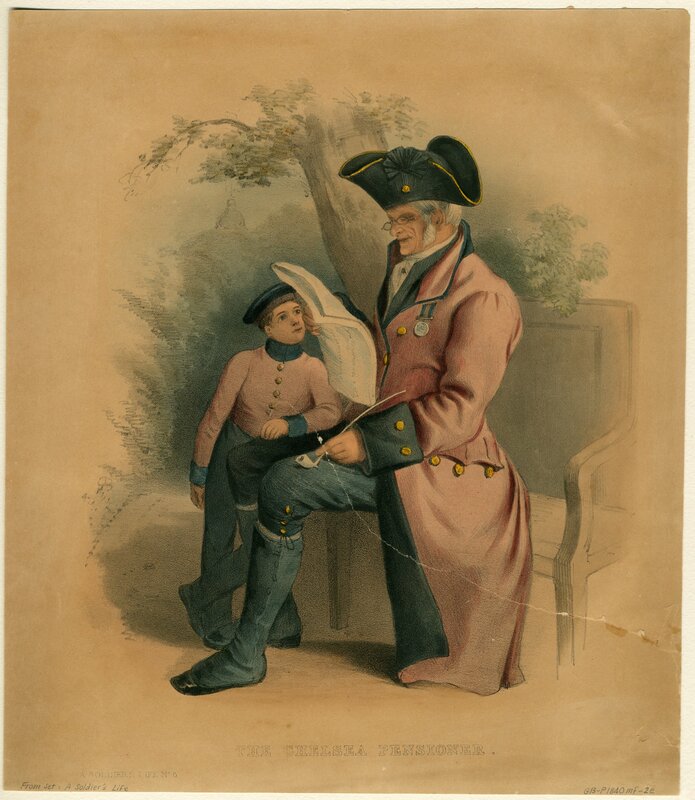 The said Alfred Threlkeld Mayson after staying at different places in Tasmania proceeded to the Colony of Victoria about the Month of May or June one thousand eight hundred and seventy seven. 4 That the said Alfred Threlkeld Mayson ever since the Month of May one thousand eight hundred and seventy six hath remained separate and apart from me and has not contributed in any way to my support or to the support of the said children. The only letter I have ever received from him was on his departure from Tasmania about May one thousand eight hundred and seventy seven and was of a threatening nature. 5 That since the month of January one thousand eight hundred and seventy eight I have maintained myself by my own industry working as a sempstress at weekly wages and have thereby and otherwise acquired certain property consisting of clothes and personal effects. 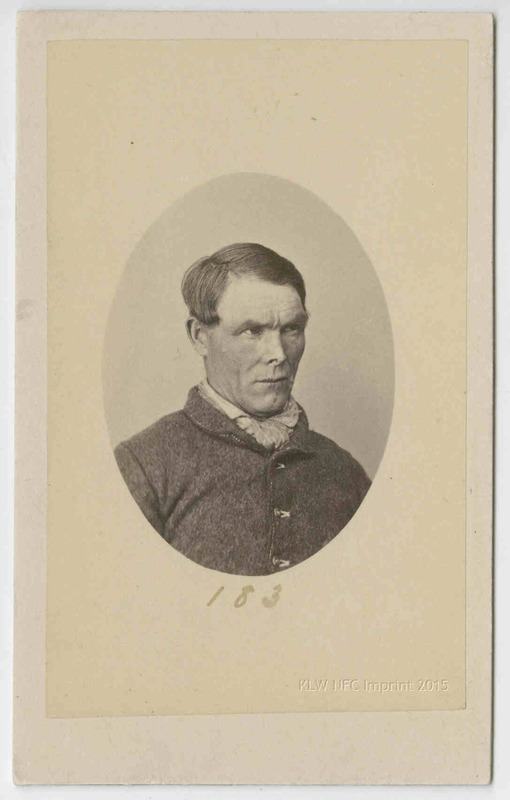 6 That I have no knowledge of the residence of my said husband but I have been informed that he has lately returned to Tasmania. 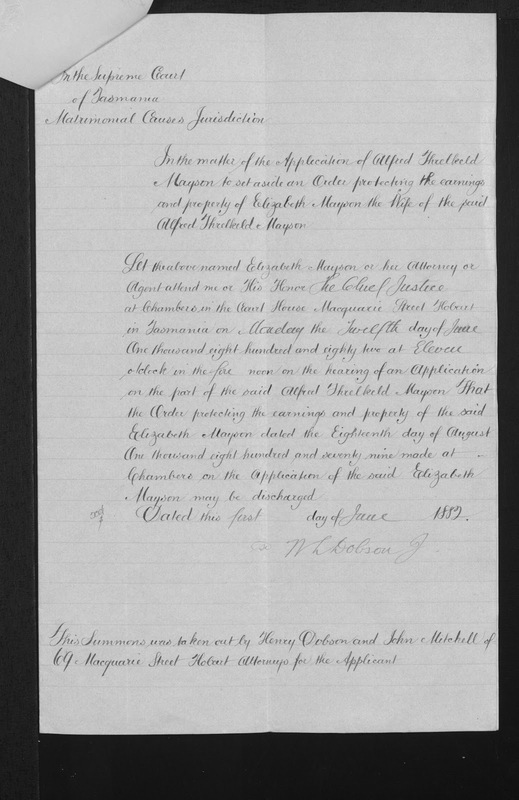 In the matter of the Application of Alfred Threlkeld Mayson to set aside an Order protecting the earnings and property of Elizabeth Mayson his Wife. Let the above Elizabeth Mayson or her Attorney or Agent attend me or His Honor the Chief Justice at Chambers in the Court House Macquarie Street Hobart in Tasmania on Monday the Twelfth day of June One Thousand eight hundred and eighty two at Eleven o’clock in the fore noon on the hearing of an Application on the part of the said Alfred Threlkeld Mayson That the Order protecting the earnings and property of the said Elizabeth Mayson dated the Eighteenth day of August One thousand eight hundred and seventy nine made at Chambers on the Application of the said Elizabeth Mayson may be discharged. Application under 29 Vic No. 19 Sec. 1. Mrs Mayson has not been heard of for years. Affa davit by Henry Dobson thatMrs Mayson cannot be found. HH [?] There is nothing to show me that there is any ppty in dispute – what is use of this ? 2. I have been informed by the said Alfred Threlkeld Mayson and verily believe that about the months of September or October in the year one thousand eight hundred and seventy nine the said Elizabeth Mayson left Tasmania suddenly without leaving any information with her then Employers Messieurs J. 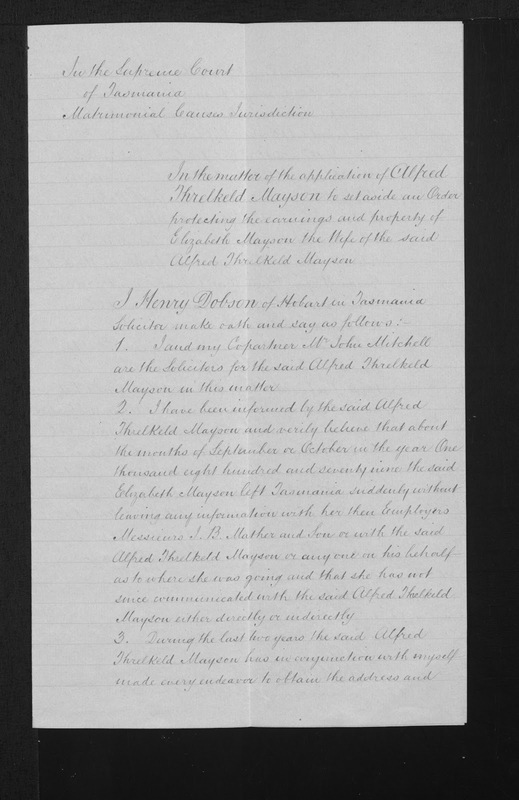 B. Mather and Son or with the said Alfred Threlkeld Mayson or anyone on his behalf as to where she was going and that she has not since communicated with the said Alfred Threlkeld Mayson either directly or indirectly. ascertain the whereabouts of the said Elizabeth Mayson in order that he might be in a position to serve her with copy summons when he should make the above mentioned Application but without success.